The last two weeks have been eventful. 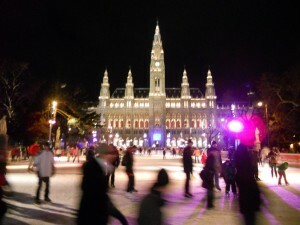 Since I last wrote, I went and roamed around the city some more, took some sightseeing pictures with my friends, ice skated at the Rathaus Wiener Eistraum (City Hall Vienna Ice Dream) – in fact it was my first time ice skating – and Suzanne said I did pretty well, as in, I actually did ice skate instead of trying to “walk” on the ice or clinging to the rail all the time! That was a lot of fun. There is so much going on, I just don’t know what to write about. I will say this, I was not super excited for the ball, as I am not much of a dancer and generally like to avoid being in crowded rooms, but I have to say, I quite enjoyed that evening (perhaps a little too much…) I had to shop for a ball gown. It is required that women wear floor-length dresses at these balls. I did not take it that seriously. Truth be told, I literally spent like five minutes looking for a gown, and purchased the first one I tried on because it fits me and it is floor-length. My friends and I agreed to meet up at a neighborhood Humana (sort of like Goodwill) after class two days before the ball. As I get out of classes later then my friends, they started their search earlier. I got to the second-hand shop when they had already decided that there was nothing promising and were about to leave. They handed me one dress that looks like an appropriate ball gown, and that was it. I fixed the straps on the day of the ball, so that it actually fits me. My point is, I am not a sort of girl who is all about dressing up and dancing all night. 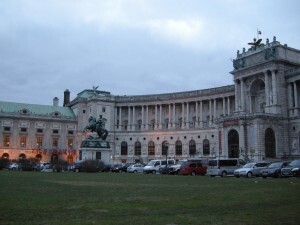 However, I was at Hofburg from around 9 pm till 5 am. We sat in the main room until the last waltz. The U-Bahn started running at 5 am, so it was perfect for us to get home. And we were welcome to take home as much of the fresh flowers at the ball as we like if we stayed till the end. I danced, but not that much. What I loved about the ball was the live music, and the elegant Viennese people, young and old, staying up dancing and waltzing all night long. Between these two weeks, I also saw two operas at the Wiener Staatsoper: Mozart’s Die Zauberflöte and Puccini’s La Bohème. For a 7 or 7:30 opera, we would go after school, get in line for purchasing Stehplätze (standing seats) at around 4:30, sit down and do some homework, get to a spot at around 6, use our scarves to reserve the standing space, and grab something small to eat for dinner around the Staatsoper. We normally get home at almost 11 after an opera. These Stehplätze are only € 3 or € 4 – cheaper than, say, if you go to a Viennese coffee shop and order a cup of Vienna size “groß” coffee, which is pretty tiny (but the coffee here is so strong and so addicting; I don’t add sugar or cream or anything). One seriously has to measure things differently in Vienna. I love it! If one wishes, the arts can play such a major role in the Viennese life. What I also really like is that, it doesn’t matter if the IES students are music students (by the way, the majority of the study abroad students at IES Vienna are not music students), almost everyone who chose Vienna can appreciate the arts, may it be going to one of the numerous museums or a ballet, opera, play, or concert. I have seen two operas so far, but many have seen three or four already. There is one opera showing at the Staatsoper almost every night, and they mix up the programs and put up different sets for each production, too! For example, this Saturday, there is Britten’s Billy Budd, Sunday La Bohème again, Tuesday Gounod’s Roméo et Juliette, Wednesday Billy Budd again, and Thursday Die Fledermaus, a ballet. There is also the Volksoper, which I have yet to go, I plan to, soon, and many other high quality and affordable venues, if one is willing to stand through the performance, that is, usw. It is incredible. The entire city’s attitude and value for the arts is so different from what I knew in the States. I think about that. I am used to societies that regard the arts as a secondary thing, perhaps leisure, entertainment, not mandatory. And yet, the arts can play a very integral role in one’s life. A way of thinking about it is that, for example, the arts cultivate the soul – then how can you live without seeing performances,visiting museums regularly? This is very realistic, but the price does influence this perspective. When I lived in Taipei, Taiwan, there were world-class performances at National Theater and National Concert Hall. I went to a James Galway (I used to play the flute!!) concert when I was eleven years old, I think, but that was probably one of the two times I have ever been to the National Concert Hall, during the thirteen or fourteen years that I lived there. It is expensive to attend a performance like that, and such a luxury can never sink into the daily lives of the ordinary residents of the city. In Missoula, my family used to be impressed by how there would be summer Symphony in the Park, International Choral Festivals, and lots of free concerts like that, so that even people who do not attend major symphony concerts would occasionally choose to drop by these casual free performances. But, let’s be honest, I live in Vienna now, everyone has high expectations for the performance quality, it is not my endearing little city of Missoula. I am willing to take standing seats and make a little extra effort, and guess what I am doing with my friends later today? Should we go see an opera, some other performances, or sit at a coffee shop? Nah, going clubbing is waaayyy too expensive. By the way, for the sake of trying, and thanks to some of my roommates who enjoy going out, I have tried some clubs and stuff, but I can’t really afford it. And because I have gone, I can say it is really not my place. Tonight my friends and I were planning on going to see Roméo et Juliette. However, dear Suzanne found out about Gustavo Dudamel (Yes, it’s DUDAMEL!!!!!) conducting LA Phil and performing Mahler 9 at the Musikverein!!!!! For 6 € we get standing seats to see Dudamel and all the amazing amazing things mentioned above! Before today I had not seen the inside of Musikverein, the instrumental performance venue, where Vienna Phil performs, so that made it extra exciting. The performance was just phenomenal and breath taking. During the Adagio, I could see, and feel, tears from people around me; there was so much emotion in the air. I thought the audience, Dudamel, and the Philharmonic became, like what my ensemble director likes to say, an organism. The performers communicated the emotion, the audience responded to it, and the music making happened as a result of this communication. The performance was incredibly delicate – the quiet notes were so unbelievable! The applause went on and on, and I was moved not only by the music, but by the energy of the people. A Viennese gentleman we talked to, he could not stop clapping at the end, and his face was all tears and sweat. He had seen Vienna concerts for fifty years, and he saw Leonard Bernstein conduct Mahler 9, which he said was his favorite. People so passionate about music like this just add to the beauty of my unbelievable evening. And naturally, I met Dudamel, shook his hands, got an autograph, and took pictures with him. And yes, he is super nice!